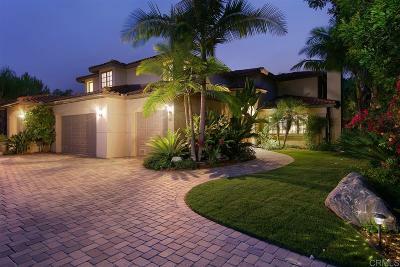 Award-winning schools, 6 miles to the sea, NO HOA/mello roos/CCRs & privately sited, this home offers grand styling & lush, tropical landscaping. Amenities include a downstairs bedroom suite, luxurious master retreat with vast, walk-in closet & a smashing kitchen open to the breakfast area & family room. On a generous .56-acre lot, the stunning grotto pool & spa with waterfalls, a fire pit, outdoor kitchen with pizza oven & raised bed gardens with fountains + a community walking trail are highly prized., 5 bedrooms & 4.5 bathrooms with 1 bedroom suite downstairs on .56 acre. A dedicated office downstairs has French doors opening to compelling gardens & could convert to a 6th bedroom. The primary retreat is luxurious and private with a warming fireplace and sitting area. The primary bath is breathtaking with a large shower, separate spa-tub, lovely maple cabinetry with sit-down vanity and a gargantuan walk-in closet. Of the 3 additional upstairs bedrooms, 2 share a Jack & Jill bath and 1 is en-suite. These bedrooms open to a 2nd family room with built-in, 2-person desk & ample room for play-space & cozy furniture. A warming fireplace & backyard views grace the formal living room. The dining room has a coffered ceiling with French doors opening to a lush lawn & the pool area. The home enjoys great-room styling with a generous family room, dining area & striking, center-aisle kitchen open to all. Built-in wine storage in the family room is pre-plumbed for a wet bar, a fireplace is central to the space, French doors open to a covered patio & outdoor kitchen & beautiful, hand-carved cabinetry was recently added. There is a fabulous, chef-quality kitchen with spectacular pool-side views, granite counters, deep, triple-compartment sink, an abundance of rich maple cabinetry, upgraded stainless-steel appliances & generous center island with plenty of room for seating. This home is sited in a highly-prized neighborhood and is as compelling as it is rare.